Shop Costume SuperCenter online at CostumeSuperCenter.com for all your costume needs. 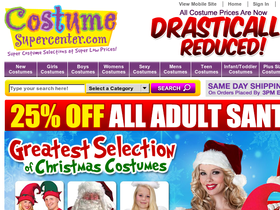 CostumeSuperCenter.com carries costumes for babies, toddlers, children, adults, plus size and pets. Costume SuperCenter has a wide variety of costumes as well as hats, wigs, masks, accessories and makeup. Save on your next purchase from CostumeSuperCenter.com with discounts, coupons, promotions and savings from 58coupons.com. Get on over to Costume SuperCenter to save 10% on orders of $40 or more with this exclusive 58Coupons coupon code. Click link for selection. Hurry on over to CostumeSuperCenter.com and save 20% on costumes costing $30 or more with this coupon code. Click link for selection. Need to exchange your costume, no worries, Costume SuperCenter has free shipping on your exchange. Click link to start shopping & saving! Head on over to Costume SuperCenter to save on Plus Size Costumes. Click for selection. Check out the clearance section at CostumeSuperCenter.com for costume items starting at only $5. Click link to view.